Beyonce, The Weeknd and Eminem have been announced as co-headliners for 2018’s Coachella, following early rumours of their appointments back in November. Revealed alongside the rest of this year’s line-up, the California desert will also play host to the likes of HAIM, Jamiroquai, Jungle, Nile Rodgers & Chic, Jorja Smith, Tom Misch, Ibeyi, Jessie Ware and more. 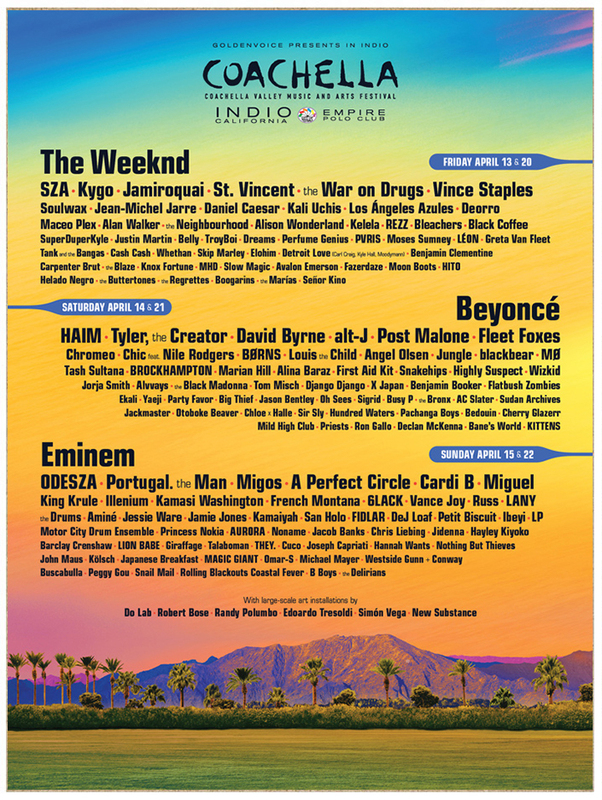 As per previous years, Coachella will be split across two weekends, with, ahem, The Weeknd opening the party on April 13th and 20th; Beyonce on Saturday 14th/21st, and Eminem closing on 15th and 22nd April.